The new Kordz PRS3 AOC HDMI cable supports UltraHD 4K, HDR and high-frame rates to work with the latest video technologies. The Kordz PRS3 AOC HDMI cable is designed for custom installation with features such as its 3kg grip, along with its 15kg pull strength. Exhibiting in booth #2327 during the CEDIA Expo 2018 show in San Diego, the new Kordz PRS3 AOC HDMI cable will make its debut with the American custom installation market. 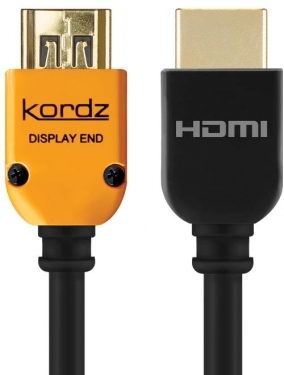 Kordz says its upcoming HDMI cable is engineered to provide long-term reliability, and its light, thin and flexible construction allows for its use in a range of installations. The cables support UltraHD 4K, along with high dynamic range (HDR) and high-frame rates for turnkey compatibility with the latest video formats. "Our commitment to 'Connectivity Assured' is clearly evidenced by the PRS3 AOC HDMI," says James Chen, managing director, Kordz. "With this cable, we wanted to simplify one-time HDMI installations and provide a high-quality solution that delivers on both performance and affordability, with no sacrifices made to material and quality control," says Chen. "HDMI cabling is a vital component in AV installs, and we are committed to ensuring that every product delivers on the high standards that integrators and end users have come to expect from Kordz. "We'd like to invite CEDIA attendees to come along to the Kordz stand where visitors will be able to get hands-on with our entire range of products and learn what we have to offer," Chen continues. Built for the rugged demands of electronics professionals, the new Kordz PRS3 AOC HDMI cable incorporates a 3kg retention grip that helps to ensure the cable will not fall out of the HDMI socket. Kordz says the grip and design of the PRS3 AOC help to prevent the cable from slipping out from the back of A/V receivers, televisions, projectors, and source components such as streaming devices and cable/satellite set-top boxes (STBs). The PRS3 AOC is a Hybrid Active Optical product that does not require any external power, unlike an extender or other HDMI connectivity products. It also features a Kevlar-reinforced internal construction to reinforce its build strength. The cable's headshell has been reduced by 34 percent from the previous version and allows for a shallow mounting depth behind components, and its 15kg pull strength enables integrators to safely pull the cable through conduit and walls. Related: What the Heck is a ‘Weak HDMI Signal’? Available in lengths ranging from 10 meters to 30 meters, the PRS3 AOC HDMI cable delivers 18Gbps throughput and is HDMI 2.0 certified by DPL Laboratories to validate its performance claims. The cable is available in fire rated CMP plenum and LSZH (Low Smoke Zero Halogen) versions to comply with fire safety specs across the globe. HDMI 2.0 certified by DPL Laboratories. Delivers 18Gbps throughput to support UltraHD 4K, HDR, and high-frame rates. The PRS3 AOC cable incorporates a 3kg retention grip and 15kg of pull strength. PRS3 AOC employs an active design with no need for external power. Available in fire rated plenum and LSZH versions.